This is probably the most interesting time of the year in regards to my new book, the working title being THE SNOWY NAP. I always stop my work so I can write a bit about my work process. I like hearing about other artist’s approaches, so I we will describe my own for anyone who is interested. I am, and always have been fascinated with the children’s book form. I think it is unique in commercial products because it is individually crafted. I do have a team I work with, the art director, Marikka, and the editor, Susan, and I don’t want to minimize their impact and efforts. Much of a traditional children’s book though, is from the mind and hand of one person. I have written the manuscript for THE SNOWY NAP, and completed the 32 page book dummy, a miniaturized and sketchy, cartoon version of my story. I had a meeting with the editor and art director at Penguin Random House in NYC last month, where they offered me their ideas and reactions. I’ve completed several finished pages and this is where the fun begins, because I can see the world that I am creating. Because I am using the characters, setting, and trim size of THE HAT, a picture book I wrote 20 years ago, I had the challenge of making it different, but I am still trying to stay true to the culture of Fyn Island in Denmark. My husband Joe Hearne is a classical musician, and I have always loved the concept of themes and variations. If you are teaching children you could illustrate my idea with two pieces of music. Benjamin Britten’s The Young People’s Guide to the Orchestra, which is variations on themes by Purcell or Brahms Variations on a Theme by Haydn. THE SNOWY NAP is a variation on the theme of THE HAT. In order to make THE SNOWY NAP distinctive I changed the palette, especially in the border. 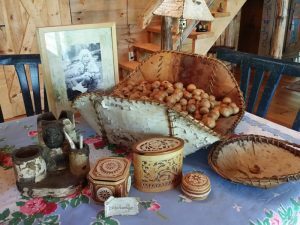 I love birch, it is my favorite tree, and over the years I have collected books about crafting with birch, and various artifacts made from birch. I have Lapti, plaited shoes from Russia you can see in THE TURNIP, ornate layered birch boxes also made in Russia, and carriers and vessels made from Native Americans. Splendiferously I had an old copy of INTERIORS magazine (I never throw them away), that has a photo shoot displaying China in a quaint setting of shelves decorated with old newsprint cut in serial geometric shapes kind of like paper dolls, where you fold the paper, cut the design, then open in up. Instead of using newsprint, I used birch bark with the pink side out. If you find a piece of birch bark it is hard to decide which side is more gorgeous, the papery, white exposed outer bark, or the interior shell pink side. Well I chose the pink because I’ve used the white in other books like THE MITTEN and HOME FOR CHRISTMAS. The rest of the border is knitted stitches with Nordic patterns, some of which I kept from Danish Museum trips when I went years ago for THE HAT to give the book a cozy feel. One of the changes I’m making in my art, is to make it a little more crafted. It is a bit of a reaction against the use of technology and computer art, which I accept is its own thing, and possibly a new art form, but I feel my work is a continuation of the art style of Beatrix Potter. It is a little hard to explain, but I feel that painting each stroke in a picture over time gives the art a soulful quality. I read once that in some cultures, I think one is Navajo, and another culture is Middle Eastern, that when creating a weaving or perhaps beadwork in the Native American art, the artist intentionally flaws the design in a subtle way to show their humility. I think all artists grapple with the perfection and extraordinary beauty of the world around us as we try to create art. Good Luck with your endeavors and creations! This entry was posted on July 21, 2017, 12:31 am and is filed under Jan Brett Posts. You can follow any responses to this entry through RSS 2.0. You can leave a response, or trackback from your own site. I am so excited for another new book! I have pre-ordered your mermaid book, and now I will be waiting for another snowy tale in the future, too. My kids and I have enjoyed your books and own most of them. I like them so much that I have designed a class based on them, which I will be teaching at our homeschool co-op this year. We’re looking forward to exploring the art, stories, animals, plants and places in all of your wonderful books! Oh, yes, the Native American always had a mistake in their creations as only the gods are perfect. Also there needed to be a way for the spirits to escape. Cannot wait for your new book. Will it be under our Christmas tree?